Note: All prices listed in USD. Total subject to change based on daily exchange rate. The Flash technique reduces the disturbance associated with extremely painful memories. It is fast, effective, and easy to learn for therapists, and allows clients to resolve painful memories without actually feeling the pain. As unlikely as it may sound, it is true. Many new research studies are validating the underlying principle of Flash, that focusing on a trauma or phobia consciously is far less effective than processing without conscious exposure to the trauma. Defenses that are normally obstacles to processing do not get activated, so the technique is especially helpful for clients who dissociate or are afraid of the intensity of their memories. Dramatic reductions in disturbance often happen in 5-10 minutes. This workshop will follow the format successfully used over this past year to train over 2,700 clinicians in Flash worldwide. Participants will come away understanding why Flash works and how to use it, experience it themselves in two ten-minute practicums, and be prepared to use it with clients immediately. Although this technique was originally developed for use in the preparation phase of EMDR, it can be equally useful in CBT and exposure therapies. Psychologists without EMDR training are encouraged to attend Day 1. 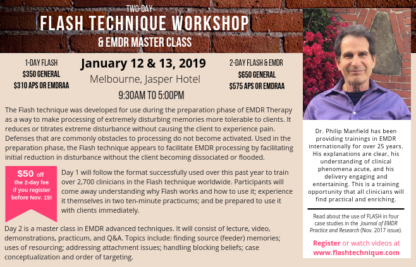 Day 2 is a master class in EMDR advanced techniques, which is open only to EMDR-trained therapists. It will consist of lecture, demonstrations, video, practicum, and Q&A. Topics include finding source memories, uses of resourcing, addressing attachment issues, OCD, and case conceptualization.